We've been spared director David O. Russell's unique vision for Naughty Dog's Uncharted series, but Sony is reportedly soldiering on with an all-new director and writer for the silver screen adaptation of Uncharted: Drake's Fortune—Neil Burger. Who? He's the guy responsible for penning and directing two films you might have heard of, Bradley Cooper superdrug vehicle Limitless and magician romance flick The Illusionist. Variety says Burger's "charting a course to write and direct" the adaptation of the PlayStation 3 video game, which is no "grabs a Burger" pun, but it's still a decent exclusive. According to Variety's report, Uncharted producers Avi Arad, Ari Arad, Charles Roven and Alex Gartner "sparked" to Burger's spin on Nathan Drake's treasure hunting adventures. 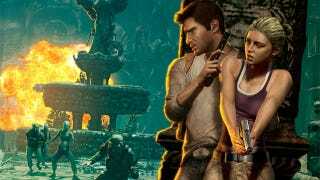 Whether Uncharted fans will also spark to Burger's vision for Naughty Dog's action adventure franchise—few seemed to shine to Russell's version of Drake and family as a team of archeological vigilantes—is still a mystery.